A mountain expert has outlined a problem affecting one of the hillwalker’s most trusted instruments, and one vital for navigation in poor visibility. Heather Morning, mountain safety advisor for the Mountaineering Council of Scotland points out that a compass’ needle can be afflicted by reversed polarity, with potentially lethal consequences. Ms Morning said navigation errors are the cause of many calls for mountain rescue, but walkers may be misled by an instrument in which they place their faith. The needle of a compass can flip so that, instead of pointing to magnetic North, it actually points south. Ms Morning said, if this happens and the hillgoer is unaware, the consequences can be serious. She said: “Picture the scene: you are out on the hill alone, ticking off that remote munro. “Unexpectedly the mist descends and you find yourself in poor visibility. Undeterred, you continue onwards and upwards. “Navigation is easy; you are ascending a defined ridge which leads onto a broad summit plateau which gently rises to the summit over a shattered boulder field. “Descent however, is a little more challenging, the underfoot conditions mean that the normal defined munrobaggers’ path has not developed; a compass bearing is required to locate the descent ridge. “As usual, your compass is sensibly attached to the zip in the chest pocket of your waterproof jacket, the same pocket where you put your mobile phone. “Taking a bearing to the top of the ridge, you start heading down. Alarm bells start to ring as the ground ahead seems to be dropping far more steeply than you remembered on the ascent. “Suddenly out of the mist, the ground drops dramatically in front of you over what looks to be quite a significant crag. You stop to re-asses. “Imagine if this had been winter and the ground was snow covered; how easy it would have been to walk right over the edge. Ms Morning, who is also a mountain rescue team member and search dog handler, said many modern gadgets are capable of affecting compasses. These include mobile- and smartphones, magnets hidden inside mobile-phone cases, avalanche transceivers, radios, personal locator beacons, GPS units, cameras, car keys, small magnets on belt fastenings, and even underwired bras. The mountain safety expert said even if your needle doesn’t flip completely, it may become sluggish and slow to settle if it has been partially reversed. It is important to keep the compass away from potential sources of magnetism both on the hill and in the home. If a compass has been affected, it is possible to ‘stroke’ it back to correct polarity by running a strong magnet outwards along the north end of the needle. Ms Morning also pointed out that Silva, one of the main manufacturers of compasses, will remagnetise one of its flipped compasses if you return it to them, no matter how old it is. She cautions against attempting to use a reversed magnet. “In my personal experience – this problem has happened to me three times in the past 12 months – the needle does not invert by exactly 180 degrees. Always carry a spare compass in case of your main one malfunctioning, getting damaged or loss. More information is on the safety pages of the Mountaineering Council of Scotland website. wouldn't you have to carry the spare compass well away from the main one because they would affect each other?? Great article. Really useful information reminders regardless of how experienced you are. Its easy to get complacent with the tools we so often rely on, and so easy to end up in the scenario you described. Thanks. Very good point (no pun intended) as this has happened to me several times over the years mostly with slip on wrist watch strap button compasses which I find mostly handy in for basic navigation in an unfamiliar urban city/town environments rather than when out in the wilds, but on rare occasions to my main compass used for taking and walking on accurate bearings in untracked or wooded, areas, low visibility and night navigation. *DON'T dump an expensive compass if this happens as they can be easily recalibrated just with two strong permanent magnets whose polarity is known (easy to find out with a correctly polarised compass and mine are dual role powerful fridge magnets). The method is to place the N pole of one magnet so it attracts what has become the inaccurately or fully reversed S pointing N end of compass needle. Then correctly place the N pole of other magnet to the S end of the needle so it starts to realign the needle's polarity. Gradually move the first magnet away with the second keeping the now correctly polarised S end of the needle pointing at the N pole of the magnet. Leave for 5 or 10 mins then place the S pole of the first magnet correctly to the N end of the needle and leave overnight to give the needle a strong polarity. I always keep my main compass' lanyard attached to a protective see through, velcro entry flexible map/walking guide case which it lives inside of to protect it whilst keeping it visible, only coming out when a bearing needs to be taken and keeping it with the map and less likely to lose or drop. The see through case is also handy for drawing out a route without marking the map underneath and making any notes with a waterproof chinagraph pencil. I started using the see through map case to tie the compass to and carried more than one bearing taking compass ever since an unusually strong gust of wind blew my compass off a bridge wall into the river below at night causing me to lose it. In winter I also have a little key ring plastic cased thermometer/wind chill calculating sheet and built in mini button compass attached somewhere on my clothing or rucksack. 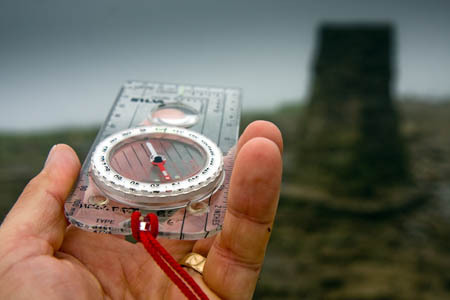 I'm old school, can't be bothered carrying an expensive GPS after 40 years of outdoor navigation, and have learnt (sometimes the hard way, as in the wind blown lost compass) over many years from my time in the military, solo backpacking/trekking in the UK and Europe. Anyone who has served/is serving as an active member on an MRT knows how necessary it is to use how many paces they do to 100m in order to accurately micro navigate combined with map and compass to within 5m of a target grid reference at night/low visibility or foul weather conditions. I'd advise making it a habit to check a compass before venturing out from home where you know exactly where North is, or if away on a trip, take note of where it is when you arrive at a location and check your compass again before setting off after an overnight stop. Prevention is better than cure and a compass should be left on a flat level surface where it's needle can swing freely to adjust if it's affected by magnetic fields because it's when the needle can't move or has restricted movement it's polarity can be changed (eg compass hung from it's lanyard or on a tilt inside a bag or pocket near a powerful speaker magnet). As well as static magnetic fields, take care to keep a compass well away from any mains electrical cable with current flowing through it as that alternates 50x per second, too fast for the compass needle to react and swing even if it's on a flat and level surface. A cable's alternating magnetic field will at best reduce the magnetism or at worst demagnetise a compass needle if left for long enough in one place. If this happens by accident because the cable has been concealed (as has happened to me), time for two strong permanent magnets with known polarities to recalibrate and correctly magnetise the needle. As well as man made navigational aids, I'd also recommend making it a habit to rely on natural senses as much as possible for orientation, such as the number one eyeball in fog, mist or cloud cover, in daytime the brightest area of the sky is where the sun is and combined with the time of day gives you a fair idea of where north is. At night time learn to identify the Plough star formation in the sky so you can easily find the Pole Star by extending an imaginary line formed by the last two stars. Use the physical feeling senses, as during the day and night the prevailing wind in the UK is mostly from the west, coupled with cloud movement (also useful to learn cloud formations to predict weather), it's temperature can also tell you whether it's got a north or south bias. Of course it can reverse to an easterly, usually for brief periods and sometimes even for weeks and months at this time of year (Feb, March & April 2013) as we've just experienced with the cold blast from the Artic or Siberia. The thing is not just to rely on a compass or even Gucci gadgets like a GPS or smartphone that could easily get broken or disabled by water, or more likely lose battery power, and to develop a high awareness, by using your senses to assess your surrounding environment as the more you combine the navigational clues around you, the less likely you are to get lost or into difficulty even if your left paddleless up the proverbial creek. With all due respect this is blatant common sense I believe? The first thing I was told when taught how to navigate was that, "like people the needle can wander to the wrong direction if attracted by bad influences, ie: magnetic fields of any kind". Yes, it sounds ridiculous, but that's why I remember it. there is a 'vast' library of mountaineering books out there where newbies can learn some techniques and just as importantly, they can learn from the history of how mountaineering has developed over those years and from its important characters. Social media won't give you all the important things you need to know about this activity. "hold it well away from your body when using it"
This is not what is taught on courses. The opposite in fact. Christian - if it's such blatant common sense, why did you need to be taught it as one of your first lessons, and have it given in an amusing similey to help you remember? Margaret - No-one claimed this article contained all the info on the subject, but it's useful advice for anyone new - and timely reminders for everyone else. A G2 watch (moderate geomagnetic storm expected) is in effect for 13-14 April. Data from the ACE spacecraft currently shows the slow rise in low energy particles ahead of the advancing interplanetary coronal mass ejection (blob). The S1 radiation storm continues, although levels began declining around mid-day yesterday. -FERNANDO"
Not an expert, but I know Geomagnetic Storms can influence comms & navigation tools like GPS, whether tools like the silva & the like are influenced presumably would depend on the strength of the Geomagnetic Storm. Chris, I didn't refer to the value or otherwise of the article above. I pointed William (and other 'newbies') in the direction of a large amount of information about Mountaineering and gave the opinion that Social Media is maybe not the best place to find the important things a 'newbie' needs to know. There have been many such storms over the past decades and I don't think they have effected compasses. Incidentally, sunspots and their associated storms can be helpful to Radio Amateurs by assisting with long distance contacts. There have been many such storms over the decades but |I don't think they have effected compasses. Incidentally, those storms can be helpful to Radio Amateurs by assisting with longer distance contacts. Iron ore in the Lake District rocks, iron in crampons, ice axes etc can cause issues. Difficult to navigate within 5 degrees but holding away from bags and rocks is good idea for accuracy. I would probably only carry spare if walking solo in poor conditions as usually a landmark or a companions compass to reorientate if polarity reversed. It has once hapened to my Silva and I got very confused before I realised wind direction will not have completely reversed. I note that my boat has 3 compasses on board for safety but that is due to lack of landmarks in open sea. Stroking the needle is easiest with the (transparent base) compass upside-down, otherwise the needle goes mad! I would have thought that you'd need to stroke the full length of the needle, so that it is fully remagnetised. Personally I'd use a bar magnet for the job, not a fridge magnet. I became aware of this at the Spring Bank holiday, Me and my daughter walked up to Great Whernside and then I took out my compass for a walk over to Buckden Pike in heavy mist, visibility down to 30 metres after consulting my compass several times and after a few hours I came upon two large reservoiirs, they were not on my map, where was I ? I decided to follow my nose and after scrambling over peat bogs and sundry hills ended up on a hill overlooking a valley and a village walked down and the village was West Scrafton, not on my map either. Knocked on a door and found I was in Coverdale 10 miles East of my target. The kind lady gave us a lift back to Kettlewell, compass no longer points North, all because I had my smartphone in my belly pocket of my jacket along with the compass ! lesson learned.